Davis''s art work often highlights carefully observed faces or figures. 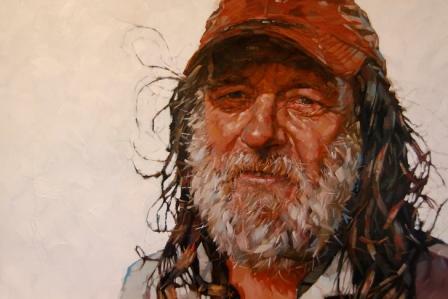 ''Newlyn '' is one such example of Simon''s individual style and attention to detail. Skilfully using light and shade create texture and depth to the study, he draws our attention, close-up, to the man''s face and expression. Simon Davis is represented by Red Rag Modern British Art Gallery. Each painting at Red Rag is sourced from the Simon Davis artist studio and like all Red Rag British art and Contemporary art it can be shipped worldwide.